We arranged through the hotel , The Charleston, for a half day city tour and when the guide came to pick us up early in the morning, we complained that the day was beginning damp and cold, not realizing at the time how precious a little cold could be. 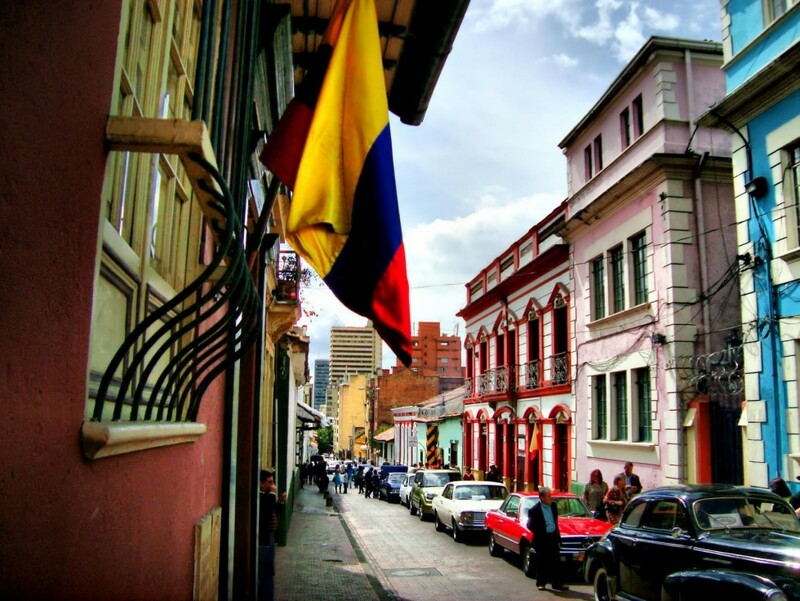 Our immediate destination was La Candelaria, the historic district centering around Bolivar Square. Simon Bolivar is the George Washington of Columbia. Born in Venezuela in 1783, he was the general who defeated the Spanish in 1819 and brought independence to Columbia, Venezuela, Ecuador, and Panama. These countries were then joined together creating the independent country of New Granada with Bogota the capital. His dream of a united South America would not be realized as these countries soon pulled away to form their own individual entities and he died in 1830 reviled by many. Later he was rehabilitated and in Columbia it is common for a city to name a plaza after him. Our guide followed Carrera 7, the Avenue of the Republic, which took us straight through the downtown area, passing the high-rise buildings of the financial district, the infamous Tequendama hotel, connected in the past to Pablo Escobar where drug deals often took place and the Colpatria Towers, the second tallest building in Latin America. The pervasive use of red brick gives the city a sense of architectural unity and it was popularized as a building material by Rogelio Salmona, Bogota’s leading 20th century architect. Applying it in an inventive manner, he associated brick, made from mud and water, as the building material that unites the structure with the earth on which it stands while providing a link to Bogota’s past as the indigenous Indian tribes as well as the Spanish traditionally built with brick. Another inventive use of brick is the Plaza de Toros Santa Maria, the bullring, built in 1931 seating 25,000 people. Here brick is used in the service of Moorish influence (Mudejar) taken from examples seen in Andalucía, Spain, the home to many 16th century conquistadors. In the earlier part of the 20th century, there was a trend to build houses in the English manner, red brick Victorian and stone Tudor. During the times of violence, people moved out of these houses seeking safety in a high-rise apartment building and these historic houses are now occupied by various kinds of businesses. One of the most distinguishing aspects of Spanish colonial towns is the plaza. Not only is it a public space used for the evening paseo, the walk abouts, but it provides both the church and state the opportunity to express authority. La Plaza de Bolivar, one of Bogota’s major tourist attractions located in the center of the historic town, was originally laid out in 1553. As expected, there is a statue of Bolivar, this one created by an Italian artist and placed in the middle of the square in 1846. The Cathedral, the seat of the Archbishop, occupies the east side of the square. This church, built in the Jesuit style, was constructed between 1807 – 1823, replacing an earlier one destroyed by an earthquake. There you can find the body of Gonzalo Jimenez de Quesada who founded Bogota in 1538. Two years earlier, he and his 900 men left from the Caribbean Coast, sailed down the Magdalena River, crossed over the Western Cordillera and hacked their way through jungle to arrive with only 166 men left. He claimed the land in the name of the King of Spain. The term Bogota is derived from “Bacata”, the name used by the Muisa Indians, famed for their skill as goldsmiths, who Jimenez de Quesada defeated in battle. Bogota is documented as beginning with twelve huts and a “hay church” and today Bogota’s cathedral is the largest in Columbia and one of the largest in South America. The National Capitol, where the Columbian Congress meets, is on the south side and the Lievano Building, the City Hall and offices of the mayor, is on the west side. Even though the plaza was laid out in1553, these buildings were built during the 19th in the neo-classical style prevalent in Europe. The Palace of Justice is the only modern building on the square and the history of its construction is part of Bogota’s recent past. When Jorge Gaitan, the left wing politician, was assassinated in Bogota in 1948, the ensuing riots resulted in 3,000 to 5,000 deaths and the destruction of most of downtown Bogota, including the Palace of Justice. It was rebuilt only to be destroyed once again in 1985 during the “Palace of Justice Seize”. At this time, the army assaulted the building responding to the actions of the left wing guerilla group M-19 who had previously stormed the building, captured the Supreme Court members and demanded a trial of the current president. The building that stands today is hard edged, a severe modern style utilizing columns in a Post Modern manner. Following our guide, we walked as boulevardiers, along narrow cobblestone streets admiring colonial buildings with red tile roofs and over hanging balconies. He pointed out several of the important colonial buildings whose flamboyant window decorations and ornate doorways were in the Plateresque style, imported from Spain, utilizing twisted columns, heraldic escutcheons and sinuous scrolls. The stucco buildings were colorful, ochre, blue, pink as well as the traditional green. The power of history surges through the historic district, within each building, a story to be told. We passed the Palace of San Carlos (Presidential Palace) and our guide pointed to the window Bolivar jumped through, making his escape after being warned by his “lover” that he was soon to be assassinated. If the story is correct, she interrupted his bath. However, the passage of time was not kind to the historic center. The area that once witnessed glittering celebrations and lavish displays of presidential visits and aristocratic gentility was forced to reconcile itself to neglect, cheap hotels, drugs and violence. However, like Bogota itself, the area has experienced restoration and revitalization and if the work being done on the Teatro Colon is an example, it will be restored to its original splendor. We enjoyed walking with our guide but the most interesting aspect of Sunday in the area around Bolivar Plaza is the large number of people who were walking in the Plaza and the surrounding streets with no other thought than to enjoy the day. The area is surrounded by churches as the Franciscans, Dominicans, Augustinians, Jesuits, Capuchins, etc., etc. each built their own church and when mass was over, the church goers joined the throngs of people. Street vendors had set up stands, selling jugos, fruit drinks, and offering a variety of arepas, the national dish made from corn meal. Artists were behind easels painting portraits. The sky had finally turned blue, it felt like an early Spring day and the jugglers, acrobats and balloon sellers contributed to the carnival like atmosphere. Walking along Calle 10, there were no cars but only bicyclers and pedestrians and we realized we were witnessing the Ciclovia Program set up by the quirky Mayor, Antanas Mockus. On Sunday, seventy-five miles of roads in Bogota are closed to cars and turned over to the people, enabling Bicycling Magazine to rank Bogota third after Amsterdam and Copenhagen as the cities most friendly to bicycles. It is not unusual for two million people to turn out on Sunday just to enjoy their city and as the other quirky mayor, Penalosa, once said “we need to walk…..to be happy”. When our tour was over, our guide drove back to our hotel along what could be called the “corniche” , the north-south road that threads it way along the contours of the mountain side. With the engine of his small van giving out complaints, we did not go to Monserrate, the top of the mountain at over 9,000 feet, but after cresting a hill, he pulled off the road and parked in a designated over look. Standing with our backs to the mountain, we stepped to the edge and down below we were treated to the grand view of the city stretching across the landscape of a flat plain. In the distance, the leaden sky, low lying silver and grey clouds, blocked out the sun welding together the sky and land. But where there were slits in the clouds, the sun shone through delineating the hard edge lines of the city and the high rise buildings scattered throughout. Tinges of red hung in the moisture laden air accentuating the red clusters of brick building, Bogota’s signature building blocks. Too far away to hear the vibrant sounds but from our vantage point, we saw the city as a three dimensional puzzle with all of its pieces fitting together forming a unity out of its multicultural parts. Down the mountainside, we crossed over mountain streams and drove past more city parks where more families were strolling and picnicking. Small chapels had been erected along the side of the road, marking the spot where someone had died in a traffic accident. Often these memorials were decorated with tinsel and plastic flowers along with a portrait of the deceased. The brakes on the little van had their opportunity to whine and continued to make their point until we hit flat land where the clouds that held out the promise of rain finally delivered. Now it felt like Fall. We believed the city tour had been a success and our guide, apparently enjoying our company, had allowed the half day tour to extend beyond its usual time. When we arrived back at our hotel, the street in front had been cordoned off by police cars and police officers were posted along the street. I huddled under my umbrella as Donald and I negotiated our way through security, wondering why there were more guards than earlier and more of those tall young men talking into their sleeves. Had there been a kidnapping, had FARC attacked? Then one of them grabbed my arm and turned me around just in time to see Donald being led away by two very large security officers. My protestations that we were hotel guests did not keep us from being thoroughly searched and when they finally determined we were not a security risk, we were allowed back into the hotel. The front desk manager explained the precautions were required because our Secretary of State, Hillary Clinton, was staying in the hotel. Then I understood why we were not given a higher floor with a better view, she and her entourage had taken all the good rooms. She was in Bogota to speak with President Uribe about setting up an additional American air base and what we hoped would translate into a show of support for Columbia in its ongoing disputes with Hugo Chavez of Venezuela. One of Chavez’s main goals is to destabilize Columbia, which he attempts to do by supporting FARC and providing them with sanctuaries in his country. This July Columbia formally accused Chavez of doing this. Chavez replied by breaking diplomatic relations with Columbia, although for only a short time, as relations were restored by early August. Travels in Colombia: What’s for dinner?